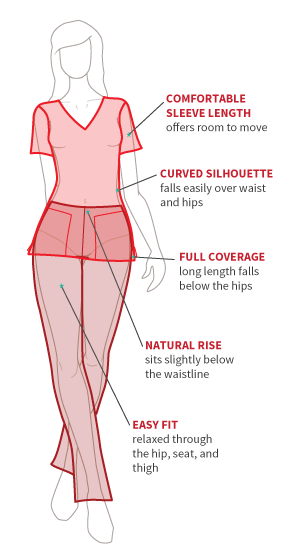 Our allheart Fit Guide is here to point you in the right direction. Choose from our 4 fits: junior, missy, unisex or athletic style. No more guessing and no need to try anything on- just read on, shop smart, and love your scrubs! The top feels like: Enjoy a longer sleeve length than junior or athletic fit tops, but a silhouette that still flatters. The hemline should fall at the hip or below for added coverage when bending or reaching. The pant feels like: Get a higher rise from the missy fit pant, usually just below the natural waist. This easy fit gives you more coverage at the top and a leg line that sits a couple inches away from the body. Missy fit is meant to be true to size. 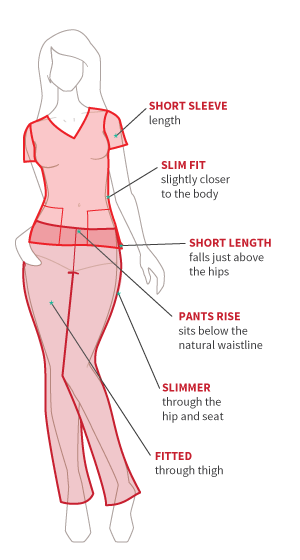 If you’re on the petite side, try ordering a size smaller than you normally would if you prefer more fitted scrubs. The top feels like: This silhouette is classic and roomy with room to breathe at the sides, and a longer sleeve length to accommodate both men’s and women’s arm sizes. These scrub tops always have a longer length. The pant feels like: Both drawstring and elastic waistbands on a unisex fit pant have a higher rise, and sit closer to your natural waistline. The legline is typically straight and offers plenty of room around the leg as well as at the seat. If you’re a guy ordering unisex fit scrubs, they should ideally be true to size. For the ladies, consider ordering one size smaller than you would in a women’s fit scrub top or pant. The top feels like: Strategic style details ensures this fit moves with you and not against you, plus a shorter sleeve length won’t restrict arm movement. 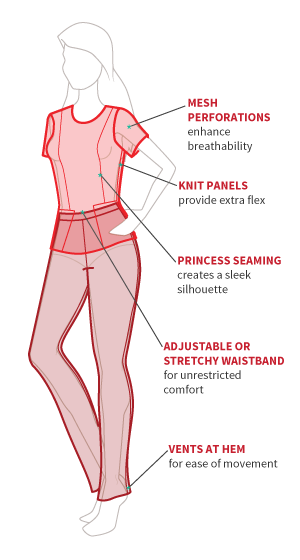 Athletic fits always include stretch are a bit roomier than a junior fit, but not as relaxed as a missy fit. Popular details like those shown here. The pant feels like: Elastic and stretch are features you’ll find on the athletic fit scrub pant. No matter the leg line, this fit allows plenty of room for movement without feeling baggy. The rise is moderate to give you full coverage throughout your shift. Many styles include details shown. Plenty of stretch and enough room for movement makes athletic scrubs true to size, but order one size up if you prefer them extra-relaxed.